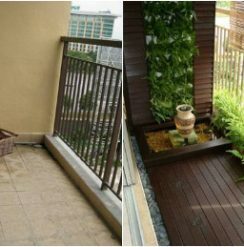 No matter how big or small your balcony is, it is important to establish zone-specific areas in your balcony based on what you intend to do use it for. Some ideas include using L shaped sectionals for lounging areas, a bar8stool or table for eating / working, and a series of long beds for planting and outdoor gardening. Most condos nowadays come with unfinished concrete flooring, leaving you with many options for how you want to decorate. Easy to install wood inspired plastic floorings are both durable and easy on the eyes. Ikea and other major retailers sell these for as low as $2 per square foot. Installation is easy and requires no tools or other materials, simply snap them together like a jigsaw puzzle. 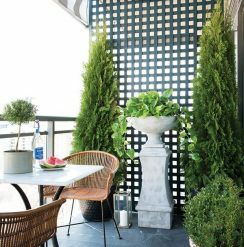 As some condos have restrictions on permanent changes to outdoor areas, these inexpensive, durable and non-permanent tiles are a great option. Choosing low profile furniture means you won’t block your prized view while still enjoying a relaxing seating experience. 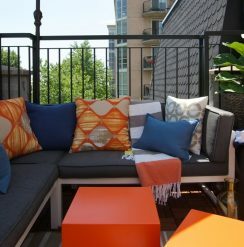 Consider weather-resistant cushions with a high UV rating and ventilation slits to avoid sun and moisture damage. Acrylic is one mildew-resistant fabric that is long-lasting. Pillows made from similar materials will also resist natural wear and tear. 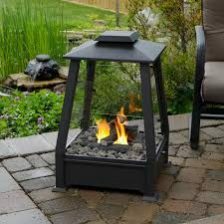 Incorporate elements form the backyard such as an umbrella or fireplace. For umbrellas, ensure that you can mount the umbrella somewhere (such as to the frame or railing of the balcony) to avoid the possibility of it flying off your balcony during high-winds. 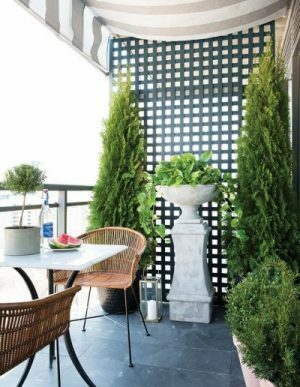 Adding a few hardy plants can breathe new life into your balcony. 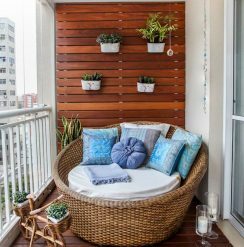 Green shrubs, vines and minature trees are great additions that will not only add a touch of nature to your city dwelling, but can also serve as privacy screens from your neighbours. It is best to choose plants that grow well in your climate. For those living in Toronto, evergreen plants such as Topiaries, Upright Cedars, Junipers, and Dwarf Alberta Spruce, will do well during summer and for most of fall and winter. Be sure to bring these plants inside during the coldest weeks of the year.